summer shoes: what are you wearing? Here in New York, shoes are our primary mode of transportation. That means that shoes really need to be comfortable and take you everywhere, but they say a lot about you and your style. And wherever you live I would imagine that your shoes are important to you too, even if you don’t do as much walking as we do in our city. I’m a bit of a minimalist when it comes to shoes. I want my shoes to work with a lot of my clothes so that I don’t have to think about them very much when I get dressed in the morning. And when I travel I only need to pack one pair and wear another but can still have appropriate shoes for any occasion. As a result, I like my shoes to look good in relatively dressy as well as casual situations and also to be versatile enough to be worn with trousers and with skirts and dresses. It’s a pretty big set of demands, but it seems like the fashion world has really been delivering lately, and if you stick with neutral colors you’re very likely to find something that will fill most of these requirements. 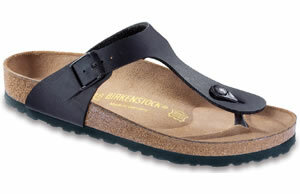 For summer, my casual, everyday around-the-neighborhood or at-the-studio sandal is usually a Birkenstock. I know, they’re not for everyone. But I’ve been wearing the Gizeh in black (and also silver since I wear them so often) for six or seven years now and they really do work with a lot of my wardrobe, which tends to be pretty casual: jeans, the Everyday Skirt (my summer basic) and even casual dresses and shorts. They’re also great for running errands and hanging out at the playground or the park, which we do a lot in the summer. For slightly dressier everyday wear, I’ve been wearing an ankle-strap sandal with a low heel for several years now. I’m still wearing the same pair now for the third year in a row and get compliments on them all the time. While the exact sandal that I have isn’t available anymore, here are some similar sandals. Again, these work well with trousers, skirts, shorts, and dresses. I love this somewhat rugged but feminine style. And for dressier occasions or events that call for heels, I always look for something that will be fashionable, wearable (by which I mean that I can walk across town in it without pain and suffering), and will last me for at least three years. These shoes don’t get worn as often as my others, but they are still versatile enough to be worn with a wide variety of styles. Truthfully, I buy more shoes in this category than I really need because I use them for a lot of Lisette and Liesl and Co. photo shoots. Otherwise I would purchase one pair of shoes like this every few years rather than one pair a year. This is the pair I chose this year. And I have to say I really love them. I don’t wear them to the studio very often, but they’re great for meetings and evening events. And I really can walk in them. And everyone needs to have a wish list, right? I won’t be buying any of these shoes since I’ve already purchased one new pair this year, but there are a lot of cute shoe options out there if you’re still looking for something to wear this summer. Again, most of these are neutral colors, save the occasional color that works well with neutrals. When I was in design school we would occasionally go on class shopping trips, and one my favorite professors would always tell us that it didn’t really matter so much what we were wearing (within reason), but our footwear was crucial. When you walk into a fancy boutique, the salespeople will notice your shoes more than anything, and you’ll fit in better if you’re wearing good quality, well-maintained shoes. I think this is true for regular life, too–not just for shopping at Chanel and Hermes. I still place exceptional importance on my shoes. And I have a very good relationship with my local shoe repairman, who I visit at least once a month for new heel and toe taps, to have rubber soles added to my shoes to help them last longer, and to do basic repairs to keep them lasting a long time. What are you wearing or planning to wear this summer? Have you found any shoes you really love? Or are you still looking? The best part of city living is feeling totally justified buying expensive shoes! 🙂 I love my kork-ease for everyday. They are comfortable enough that I can keep up with two kids on scooters, yet totally respectable at the occasional happy hour. Since your picks started popping up on Pinterest, I’m totally obsessed with the Rachel Comey booties! Kristi, I have a pair of the Rachel Comey booties and they’re incredible! So lightweight and comfortable. And a practical year-round option, too. And yes to Kork-ease! They make some really cute and wearable shoes. I pinned another pair from them that I really love, but I don’t think the company is making them anymore. I adore the Majorca Sandals you bought! I totally agree with your shoe policy, here in Berlin the same is so important. And my parents used to tell me the same about first appearances and shoes 😉 So true. I love my Birkenstocks, too (I favor the Madrid model) but I am still getting used to them being so hip; I used to wear them all the time when I was young but they always had a feel of “farmgirl chic”. 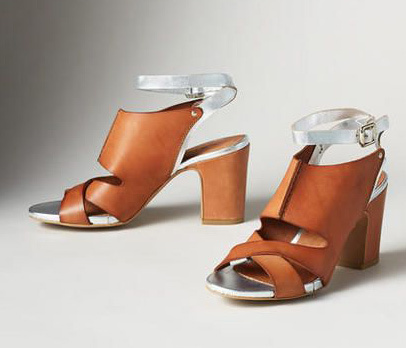 I got a pair of sandals similar to these (http://www.zappos.com/madden-girl-tone-blush-fabric) for summer. I wear them daily. I normally wear flip-flops but the pair I had were pretty worn out after several summers and desperately needed to be replaced. This type of sandal seemed to be a bit more “adult” but still fun. I was a bit unsure about the ankle strap but they are really comfy. I think these will be around for many summers to come. Fabulous CLEAN hair and shoes and the rest will come together, that is what I was brought up with. I adore shoes and I justify buying nice ones as I sew most of our clothing. However, I will tend to have just a few nice outfits, my black linen Portfolio springs to mind, and mix it up with lots of different shoes. I also love vintage and happily wear second hand shoes. I am definitely not fashionable. However, as we are coming into cooler weather and I am pregnant I am favouring my RM William Chisolm ladies boot and my sheepskin lined Emu brand long leather boot. Nicole, I love those leather and elastic slip on boots! I bought a pair when I lived in France, but unfortunately no longer have them, I sure miss them. Oh, shoes. Investing in great shoes is key. Summer shoes are hard though — I need to be able to walk at least a couple of miles in them in heat and humidity, but also wear them in a frigid, uncomfortably air conditioned office. I have a pair of black patent leather Gizehs that I’ve worn a lot for the last five or six years, but they’re getting pretty beat up and even though our office is on the casual side, I’m not really comfortable wearing them to work anymore. I have a pair of silver wood-soled mary jane Sven clogs that get a lot of wear, especially since they’re relatively inexpensive to get resoled. Ditto these higher-heeled t-strap clogs, which I have in black: http://www.svensclogs.com/womens-clogs/high-heel-clogs/diamond-strap-clog-3-high-heel-sven-style-4183.html. I could really use a pair of flats or flat sandals though, but it’s hard to find a great pair that’s comfortable and flattering and offers at least a little protection from sidewalk filth. Last summer, I basically lived in these Clarks, which seem to have been discontinued: http://www.landsend.com/products/womens-clarks-indira-rue-sandals/id_258461?cm_mmc=139971612&source=GS#. They were actually very comfortable and looked good with everything, but weren’t all that well made and fell apart after one summer of (admittedly hard) wear. I’m tempted to get a pair of black canvas Toms and call it a day, but that feels like giving up somehow. After admiring your Gizehs at the Weekend Sewing workshops, I bought a pair and love them! This summer, I bought a patent turquoise pair for fun. Love the no. 6 sandals you posted. How did I miss this post, this is so great, thank you! 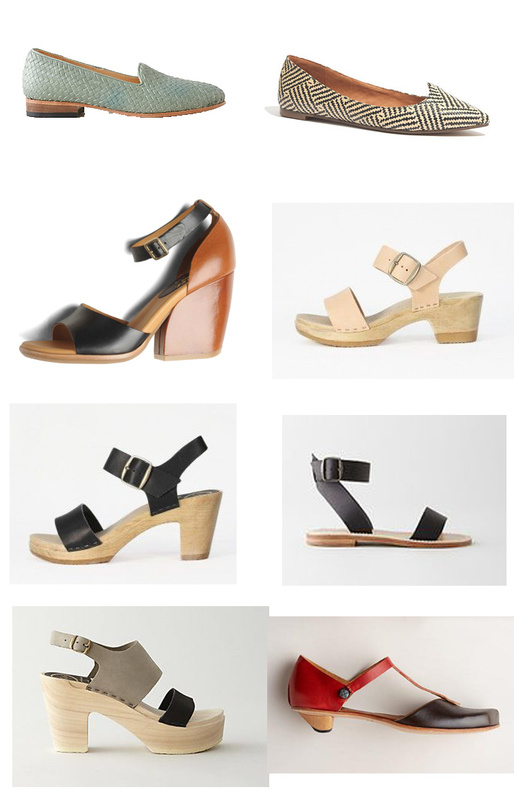 The Madewell Lora sandals pictured above (#2 in the set of pics right after the Birkenstock photo) are on a great close out sale right now (brown color only), if anyone is interested in picking up a pair for next spring/summer. Limited sizes available – I was happy to find my size still in stock :-). Thanks for the recommendations, Liesl!